Have you ever wanted to explore one of the world’s oldest rainforest? Kuranda tours with Tropic Wings are the best way to get up and personal with the Kuranda rainforest and the animals which live in it. We offer daily Kuranda Tours, allowing you to explore picturesque tropical rainforest nestled among the peaks of the Great Dividing Range. With only 25km to travel from Cairns, Tropic Wings Kuranda Tours are one of the best ways to access this World Heritage Listed area. The village of Kuranda is a vibrant, welcoming town surrounded by rainforest. The historic buildings from Kuranda’s past surround the numerous cafes, restaurants and bars – giving you plenty of places to refresh while you explore Kuranda’s many shopping opportunities. If you are wanting to make your Kuranda tour even more memorable, the Australian Butterfly Sanctuary in Kuranda allows you to get up close and personal with over 2000 tropical butterflies. A short shuttle bus ride from Kuranda can also bring you to the Rainforestation Nature Park, where you can meet native Australian wildlife, learn about the indigenous culture and explore the rainforest aboard a WWII Army Duck. This is a great way to top off your tour! Tropic Wings allows you to make the most of the Kuranda Tours – with options to travel by coach, Skyrail or on the Kuranda Scenic Railway, you can mix and match to ensure your Tour is an unforgettable experience. Scroll down to learn about the available Tours and inclusions. If you have any questions, our friendly team are available on Live Chat to assist. Join this comprehensive full day tour to Kuranda and experience the best of the picturesque mountain village, including a visit to Rainforestation Nature Park. 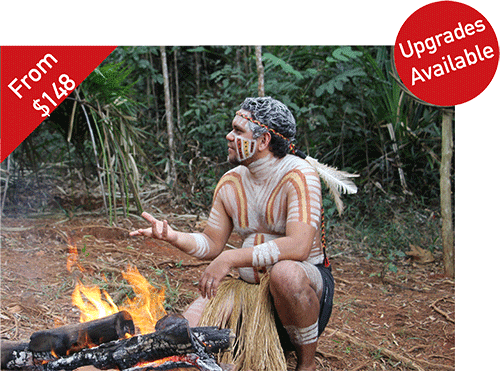 You’ll learn about one of the world’s oldest rainforests, the local Indigenous culture, and the native wildlife of Australia. 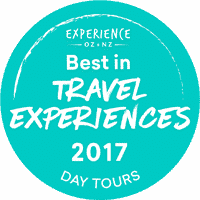 Includes Kuranda Scenic Railway and Skyrail Rainforest Cableway. Enjoy a full day adventure to Kuranda, including a visit to Rainforestation Nature Park. 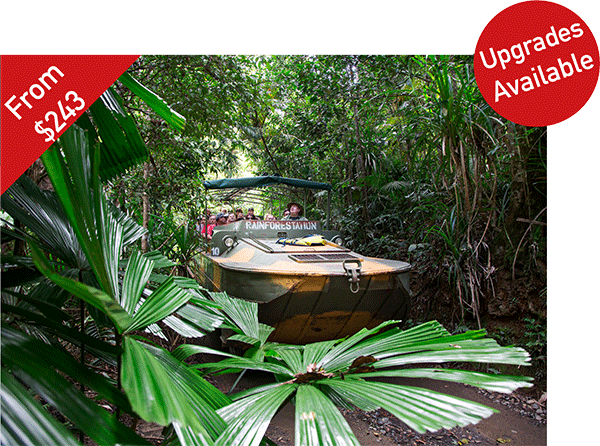 Learn about one of the world’s oldest rainforests on a World War II Army Duck, on land and water. 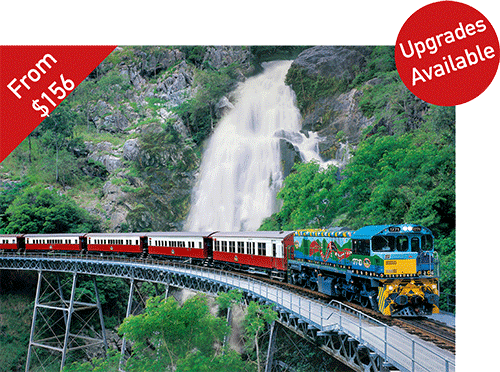 Travel by Kuranda Scenic Railway with a choice of two departure times, and return to Cairns on Skyrail Rainforest Cableway. Includes Kuranda Scenic Railway and Skyrail Rainforest Cableway. Join this full day tour to Kuranda. Visit Rainforestation Nature Park and learn about one of the world’s oldest rainforests, the local Indigenous culture, and the native wildlife of Australia. Travel in modern, comfortable coaches. Optional upgrades available. 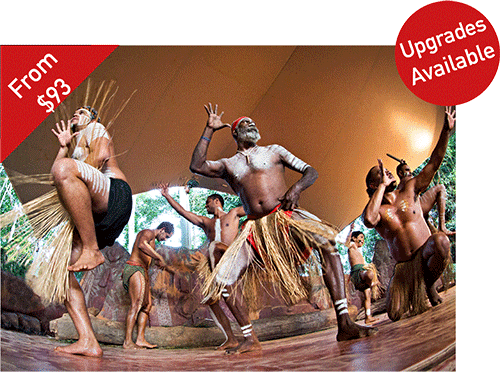 Learn in-depth about Indigenous culture in this awesome premium package, which also includes the best of Rainforestation Nature Park, and the opportunity to create and take home your very own Aboriginal canvas artwork. Enjoy a full day adventure to Kuranda and explore the village and surrounding areas. 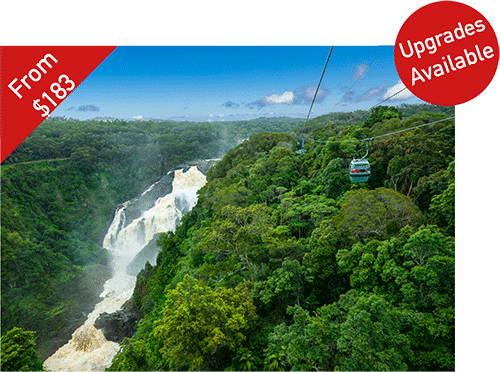 Travel by Kuranda Scenic Railway and Skyrail Rainforest Cableway.